Kaju Pista Roll, it brings back lot of memories to me. 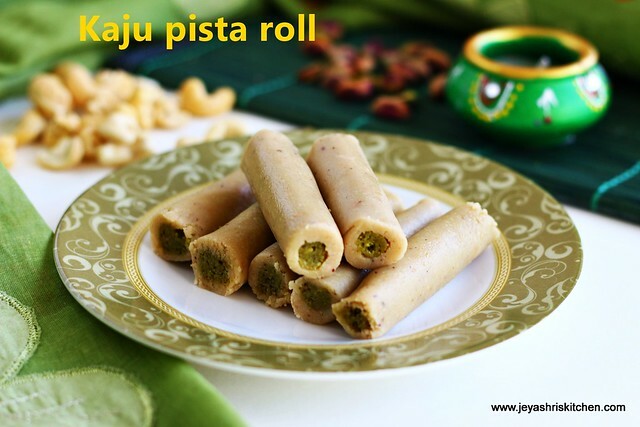 As we have seen the kaju pista roll in mithai shops, it is always tempting . I first say this in Krishna sweets when i was in chennai. Also the different shapes of kaju katli like apple, watermelon will be very fascinating for me. Actually i wanted to do the kaju watermelon but thought first will post the kaju pista roll as i am confident in that, because i have tried this 3 years back too. A reader requested for kaju watermelon too, but will post how to shape into watermelon with a different recipe, and not with kaju. Coming to this kaju pista roll,as i said i have tried this 2 year back for a Navaratri. One of my very close friend, who now moved back to India, invited all the friends for Navaratri. Since i don't have the custom of keeping golu at my house, i used to help her out with few things on the day she invites everybody. After breaking our head too much finally we decided to make kaju pista roll for a big crowd of 35-40 people. The beauty is both of us haven't tried the recipe before. 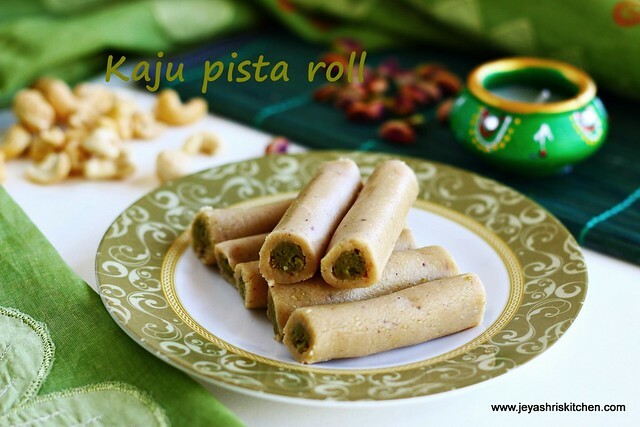 I know how to make kaju katli, but never attempted the kaju pista rolls. With some guts we started with large quantity of cashew and pista and made the dough. The recipe she has in her handwritten cookbook, copied from snajeev kapoor's website. Just orally she told how to roll it and we both started making it in my home. I still have have the pictures in my album too. I started rolling it too thick and the kaju pista rolls are coming so big like logs. We both were laughing on seeing such logs and the entire project was totally fun. We laughed and laughed and finished making so much of kaju pista rolls spending more than 3 hours.Later we packed also some rolls to few close friends as there were many. But taste wise they turned out very perfect. Even if i think about that i will laugh. When i told my friend i am going to post kaju pista roll, she too recalled all the sweet memories we had. Actually i made this 2 weeks back for an event, but didn't have time to click. Made this again for my friend's son who is very fond of kaju katlis. Check out my full Diwali collection recipes. Follow Jeyashris Kitchen on Facebook for latest updates. Always ensure before making the kaju pista roll, both the cashew and pistas should not be taken out from the refrigerator and used immediately. If so, it will ooze out more moisture while grinding and will not turn out good. Always ensure that both are in room temperature. Keep them out for 5-6 hours and pat dry them well, if you kept them in the freezer. Even you can roast it a pan for 2 minutes and then grind. I did this for the pista as by mistake it was kept inside the refrigerator the before day. Grind the cashew first to make the cashew dough. Pulse it 2-3 times in the mixer, if it is slightly coarse, it's ok. After making the dough when you knead it it will be perfectly smooth. In a pan add sugar and little water. Let the sugar dissolves and comes to one string consistency. Always non stick pan will work out well for kaju sweets. I first put sugar syrup in the normal pan and then transferred to the non stick pan. Since my non stick pan is big i thought it will not get covered in the camera. Then finally put a step stool and clicked the picture. Now coming to the recipe, Once the sugar syrup reaches one string consistency, add the kaju powder to it. Mix it for few minutes, when it comes to a whole mass and leaves the sides, transfer it to a plate. When it is warm enough to handle,grease your hands with ghee and knead it into a smooth dough. If you feel the mixture is dry sprinkle little milk to the dough and knead it. If it is very soft and not forming the dough, cook it for few more minutes in a low flame. Keep this dough covered all the time. Even if it becomes slightly dry, sprinkle few drops of milk and knead it again with ghee greased hands. But remember adding more milk will reduce the shelf life. Lets now make the pista dough. Actually you can either powder the pista and sugar separately and mix this well and knead with milk or water to make a dough. But i made it in the same way as we did the kaju katli. As i said i slightly roasted the pista and then made it into a powder. Do not roast till it becomes hot. A slight warm is enough. Heat a pan and add the sugar. Boil till it reaches one string consistency. Add the pista powder to this. Stir well in a low flame. Add the green food colour to this. 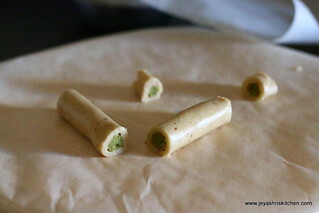 Adding colour is optional, but since i have already attempted this cashew pista roll, i found the green colour was not much visible and vibrant in the pictures. So i wanted to add the colour. Feel free to skip if you don't want. When the mixture comes to a whole mass, switch off the flame. When it is warm enough to handle grease your hands with ghee and if needed sprinkle little milk and knead it into a smooth dough. Take equal sized balls out of the kaju dough and slightly smaller than that with the pista dough. A lemon sized dough will be perfect. Keep it covered all the time. Take a rolling board and cover it with a greased zip lock cover or a butter paper. Place a kaju ball in the center of it. cover it with another cover or another sheet of butter paper. Roll this kaju ball as we do for a poori. Do not roll very thick or very thin. Roll the pista ball into a thin log. Take out the butter paper on the top and place the pista log in the edge of the cashew which we rolled. Start rolling it gently. Do not worry it will come out very well and ease. Roll it tightly and once done completely roll it front and back twice gently. Cut the edges as they may be uneven. Cut the roll into 2 and your kaju pista roll is ready. Always ensure that the nuts are in room temperature.Ddo not take it out from the fridge or freezer and start making it. Even though if the cashew powder and pista powder is slightly coarse, no need to worry, it will be smooth when you knead it later. Always cover the dough else it will become dry and will not be able to roll it. Adding little is ok, but too still it will reduce the shelf life. 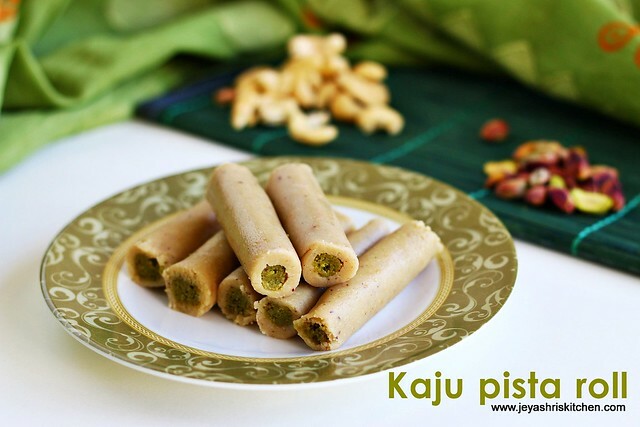 The kaju pista roll will stay good for 3-4 days in room temperature and for a week in the refrigerator if handled with clean dry hands. Store in a clean dry box. Very painstakingly done Jeyshree. Congrats! You have a lovely blog. Fantastic recipes. Please can you spare some time to visit my 4 month old blog and comment how it is? Thanks in advance.